Over the past nine seasons, the Colts and Chargers have become rivals despite the 2,000-mile distance between the two organizations. During that span, the two teams always met late in the regular season (the earliest contest being Nov. 11), with a pair of playoff battles. Of the seven contests, six were separated by single digits and the rivalry will be renewed in 2013 when the Colts head west to take on the Chargers. The rivalry will have a much different in feel in 2013 with Chargers coach Mike McCoy taking the reigns in year one. McCoy and new general manager Tom Telesco are at the helm in San Diego and are in the process of making changes they feel necessary to getting the Chargers back into the postseason. “Whether it’s running the facility, the way things are done, the organizational structure of everything and then really getting to know everybody as a whole in the organization, not just coaches.” McCoy said of the team’s changes, on Thursday at the NFL combine. One aspect of the rivalry that won’t change in 2013 is the presence of Philip Rivers quarterbacking the Chargers. The new coaching staff walks into a scenario where Rivers is an established quarterback but McCoy does want to improve on Rivers’ 55 turnovers the last two seasons. The 2013 season marks Rivers’ 10th in the NFL and McCoy loves the intangibles that his quarterback carries with his career entering the final stages. “(Rivers) has a burning desire to win. That’s what all the great ones do,” McCoy said. It’s been a three-year playoff drought for the Chargers, and McCoy is ready to help Rivers get back to a postseason that had become a common occurrence (2004, 2006-2009) for the Chargers. “Tom Telesco and I are going to do everything we possibly can to build a winner over the long haul. Not just tomorrow, but for years to come,” McCoy said. Denver had an excitingly difficult season in 2012, going 13-3, owning home-field playoff advantage and then losing in overtime in the first round, giving up a late long touchdown pass in regulation. The Broncos watched Baltimore move on to win Super Bowl XLVII, and General Manager John Elway remembers the feeling. He wants his team to do so, too. Elway is earning his spurs as a league executive. He is competing in a division with two new head coaches, including Andy Reid in Kansas City. Elway feels better at this combine than at past combines with the state of his roster, but now is no time to feel safe. “We have to get better because everybody is. 13-3 is not good enough,” said Elway. “It was nice we won the division and had home-field advantage but when you lose in the first round of the playoffs, you have to get better. Elway won titles in his final two seasons. His quarterback, Peyton Manning, has one title in an illustrious career. Elway watched Manning star in the same city where he shaped his own legacy. “He had a tremendous year. Talking to other guys who have been through what he’s been through with that neck, there was a lot more to it than I knew,” said Elway. “I think he exceeded expectations now that I know what he had to go through, not so much physically but mentally. Elway feels quarterbacks now entering the league are better prepared than before. His school turned one out in Andrew Luck, and Elway is among many who anticipate next year’s Colts-Broncos clash in Indianapolis. “It will be special. 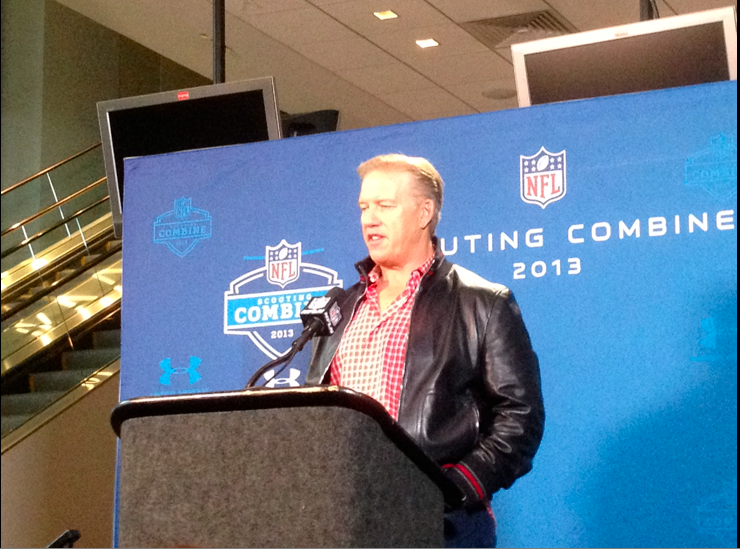 I’m sure it will be special for Peyton,” said Elway. “Any time you spend as long as Peyton did in Indianapolis and the relationship he has, to go somewhere else and play had to be tough. Growing up in the shadow of the Golden Dome, Braxston Cave always envisioned himself playing for the University of Notre Dame. That dream became a reality for the Granger, Ind. product as Cave anchored the middle of the Fighting Irish offensive line with 35 starts over the last three seasons. Cave has been a lineman since he began playing football and even though his college days are over, he still feels the continuity of five guys working towards a common goal during his draft workouts. “Being pushed as an o-line, it’s not just pushing just one guy. It’s five guys you have to take to another level,” Cave, who is one of the strongest centers in the draft, said on Thursday at the 2013 NFL Combine. This past season, Cave and the Irish performed at an extremely high level turning in an undefeated regular season and a spot in the BCS Championship. With the combine taking place this week, Cave said he has tried to focus away from where he his name falls among on the other centers. “That stuff seems to change every day. I put my work in the last four, five years. It’s all on film,” Cave said. In 2012, Cave snapped for a balanced offensive attack that produced 2,462 yards on the ground and an additional 2,896 through the air in leading Notre Dame back to the National Title game. The goal for Cave this week is showcasing his athletic ability that was not as displayed in the offensive system the Irish ran. 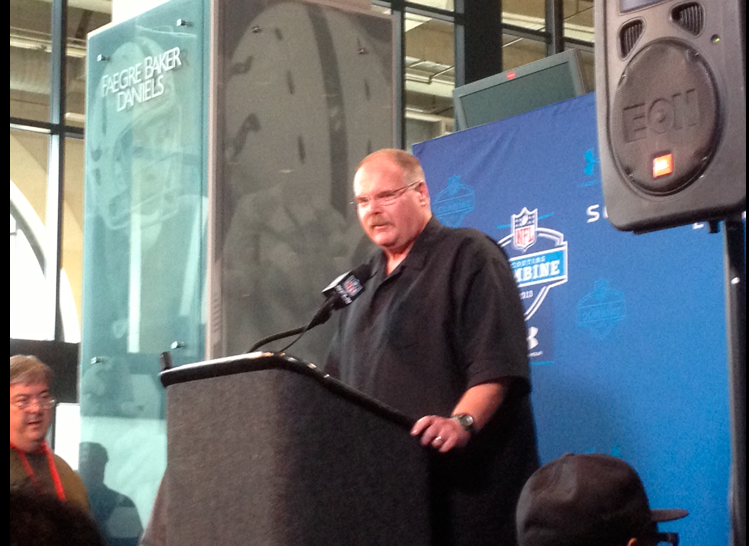 A ‘fired up’ Andy Reid speaks with the media on Thursday at the NFL Combine. Reid is embarking on his first year as the Kansas City Chiefs Head Coach. Andy Reid has been down this road before. Back in 1999, as a first-year head coach of the Philadelphia Eagles, Reid walked into a team with the No. 2 overall pick and looking for a franchise quarterback. The Eagles struck gold with Syracuse signal caller Donavon McNabb and Philadelphia made six playoff appearance over the next eight seasons, after missing the postseason the previous 10 years. After 14 seasons with the Eagles, Reid moves on to his next challenge with the Kansas City Chiefs. Last year the Chiefs struggled to a 2-14 record and enter the offseason with the No. 1 pick. “It’s important that we go through and evaluate everybody,” Reid said at Thursday’s NFL Combine. Reid enters the fold with the Chiefs after a tumultuous 2012 where he his son, Garrett unexpectedly died during the Eagles training camp. A 4-12 regular season would follow for Reid and the Eagles, and the longest tenured coach in the NFL would be fired on the final day of 2012. Listening to Reid on Thursday though, the head coach seemed rearing to go on to the next chapter of his life. “I am fired up to be here,” Reid said during his opening statement to the media. Reid called the process in Kansas ‘a great challenge’ but there is no denying the stock piling of former first round picks that litter the Chiefs roster. For the second straight season, the Chiefs will welcome the Colts to Arrowhead Stadium and Reid is anxious to return the energy back into one of the league’s most intimating environments. Flashback to four years ago and as a 230-pound graduating high school senior, Eric Fisher could hardly get Division I colleges to notice the tight end prospect. He had a pair of MAC offers and there was still the question of whether or not he could put on the necessary weight to become a Division I offensive lineman. Turn the clock to 2013 and the now 305-pound Fisher is on the minds of nearly every NFL general manager this week with the possibility of being the first offensive tackle selected in April’s NFL Draft. “It’s just amazing watching my dream becoming a reality, slowly,” Fisher said at Thursday’s NFL Combine. While Fisher grew into a dominant tackle in the MAC and the All-American honors followed, he still felt he had to prove himself at the Senior Bowl. Going up against some of the nation’s finest defensive linemen, Fisher wowed scouts and has seen his stock blossom into a potential top-10 pick. “I knew what I had to do to impress a lot of people and cancel all the doubt in people’s minds at the senior bowl so I went down there with a little chip on my shoulder, on a mission to prove to a lot of people who Eric Fisher is and what he’s made of,” Fisher said. At this point it seems to be a foregone conclusion that Fisher will hear his name called in the first round of the 2013 draft. When that time does come, Fisher will join San Francisco 49ers offensive tackle Joe Staley as the lone CMU products to become first round picks. Fisher returns to the Midwest this week looking to supplant himself as the top tackle in this year’s class. “That would be a huge, huge honor, and obviously a dream complete,” Fisher said. Ryan Grigson was very much at home Thursday talking about his football team to approximately 30 media members surrounding the podium at which he was located. Grigson talked openly about his team. He was in a good mood because he was in the environment he loves the most – scouting for talent. What a difference for Grigson from last year, when he was at a podium a few feet away not being able to speak in specific terms about very many matters. Yesterday, he took a wide range of questions, even a hypothetical or two. It was an informative and fun give-and-take. Grigson mentioned that he feels Chuck Pagano is back to being “Chuck,” and that one of his duties last year was to keep tabs to make sure the ill coach did not push himself back to the worksite too quickly. Grigson also was asked if the team’s success had anything to do with Pagano’s illness. “There’s no doubt with Chuck being ill it galvanized our team, and it really brought us together. Maybe sooner? No one really knows. Maybe sooner than it would have had he not (been ill),” said Grigson to a question where there is no ironclad answer. What Grigson knows is he has a football coach who reaches players. Pagano is a field leader who provokes positive responses from his troops. Pagano also established a foundation from which the team did not deviate in his 12-game absence. Grigson and Pagano are taking their second trip around the block together. The 11-5 walk in 2012 was not easy, but it was fun. Part of what made it so was the type of players the duo attracted and influenced. They are back at it. “I know this, we look for the same type of guys this year that we looked for last year, guys that play snap-to-whistle. Guys that buy into Chuck’s philosophy, and that’s to play hard, physical, get in your book, do the right thing,” said Grigson. “All the things that make you great, that’s what we’re going to continue to do.